The TFM-8000W is one of Sony’s iconic Super Sensitive series of radios…a name plate Sony proudly promoted for several years. It was marketed simultaneously with the top of the line multiband CRF-5100, and the AM/FM only TFM-7250…all described as Super Sensitive. While it overall takes a back seat to its upscale brother CRF-5100, and may therefore be considered somewhat of a sleeper (you just don’t hear much about them), it is one of very few portable radios ever to offer true flywheel tuning which gives the radio a wonderful feel for band scanning. The straight-forward dial scales are visually appealing and a signal meter is also a nice addition…this is a fun radio to use and I very much like its looks and feel. It is a single conversion design, has a 4″ speaker driven by a 2 watt audio amp, has a compliment of 17 Transistors, runs on 4 Size D batteries or 120V AC (US Version) with a built in power supply, measures approximately 11 7/16″ Wide x 8 1/4″ High x 4 1/8″ Deep, and weighs about 7 lbs. with batteries. 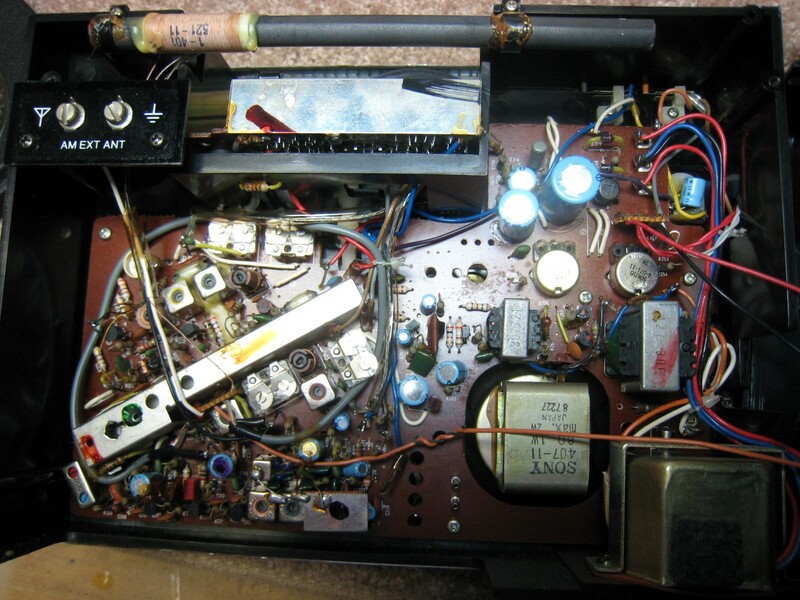 Finding TFM-8000W: I began my search in the usual way, on eBay. Because these are larger radios they are easier to find in good cosmetic condition than smaller portables which probably lived harder lives. But I also found a few with some meter problems and a few with burned out lamps and these seemed like relative bargains so I opted for one of those. When it arrived I was gratified that its cosmetics were quite pristine and it did seem to operate quite well with reasonable reception and only slightly erratic controls. The only real problem was that the tuning meter seemed to read lower than normal, not quite reaching even half scale on strong local signals even though reception seemed normal. I had already obtained the service manual before the radio arrived so I was ready to get into it. 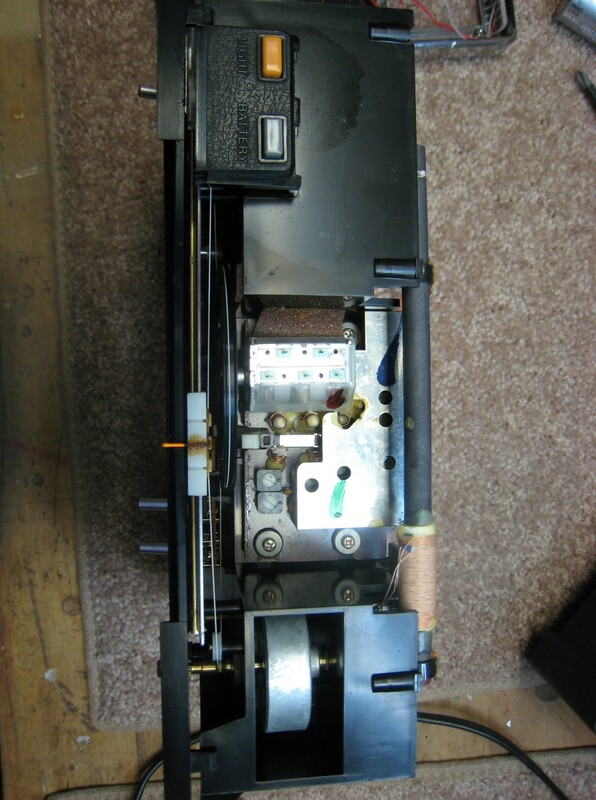 At first I suspected a circuit problem or lack of alignment for the meter problem but it turned out to be entirely mechanical, and when I realized that I had heard of other sticking Sony meters it made sense. I also noticed that when I hit battery test the button the meter still did not deflect fully even when running on AC. I found it was fairly easy to separate the front half of the meter enclosure to reveal the delicate movement. I couldn’t actually see where it was binding but I moved it manually to full scale and back a few times and it seemed to become free. I also used some very gentle compressed air to clean it out and it seemed fine now. I suspect either some flexing or stress of the plastic enclosure or a small piece of debris caused the binding. Re-assembly was easy – it snapped together and it has continued to work fine ever since. 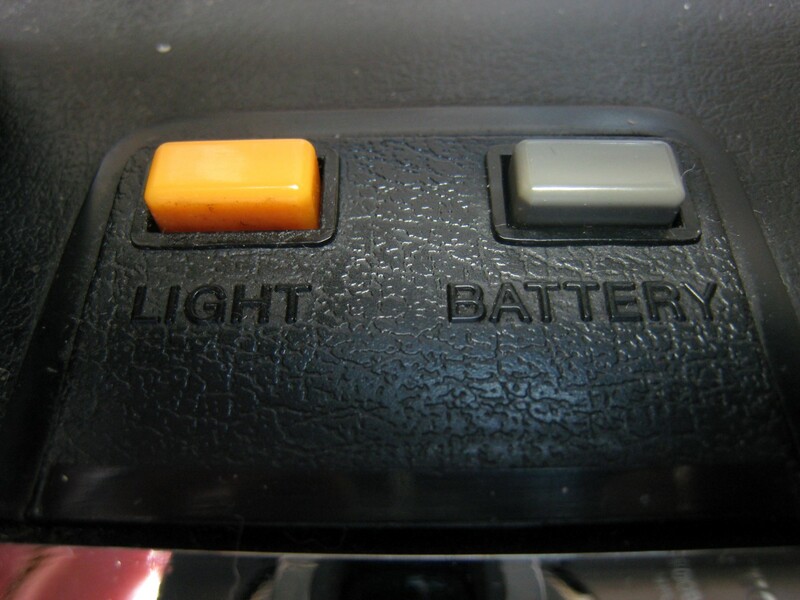 I cleaned the erratic band switch and all the controls…all responded and were now solid and quiet. The alignment was straight forward following the Sony Service manual. Most of the adjustments were relatively close to where they should be but there were a few points where I got noticeable improvement so I was gratified to be sure this unit was fully up to its capabilities when I was done. All bands seemed to be quite sensitive and working well. I was also impressed by the heavy flywheel on the tuning shaft. Although such flywheels were once common on quality home audio equipment and communications equipment I have never before seen one in a portable radio. 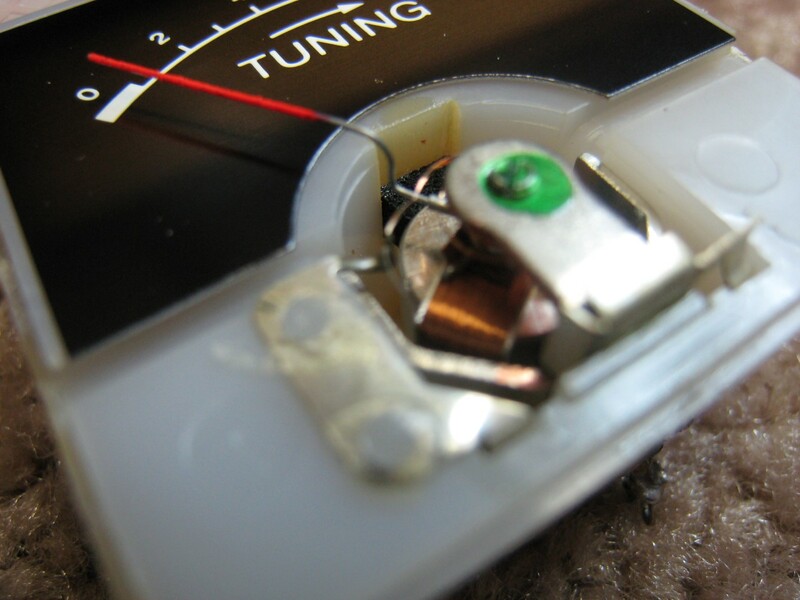 You can literally spin the tuning knob and it will continue to coast from one end of the dial scale to the other. This may sound frivolous but in actuality it greatly increases the ease of use of an analog radio, making it a breeze to get from one end of a band to the other almost instantly…it is a complete delight in use. In fact it seems odd that flywheel tuning is not included in the otherwise upscale CRF-5100. 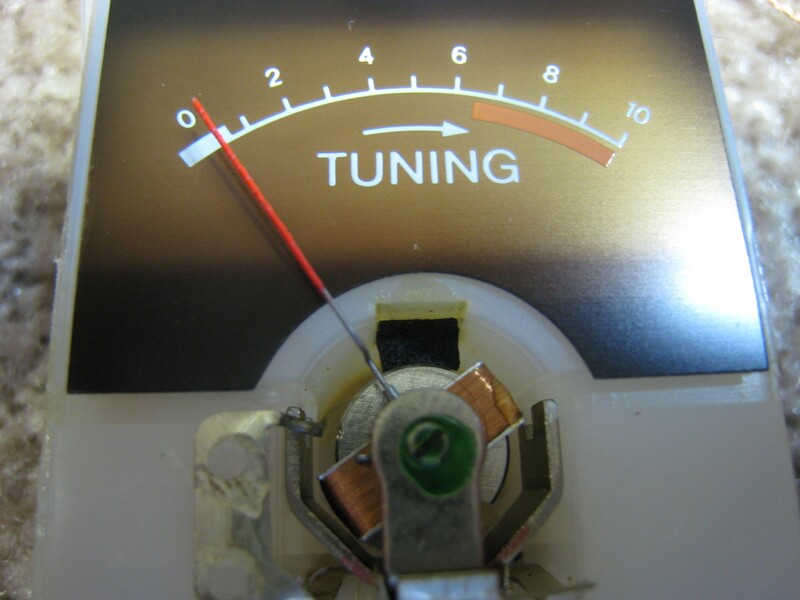 There is also a continuous variable fine tuning control which made SW tuning much easier. Performance: I tested the TFM-8000 against other radios to find its place on the AM Mega Radio Shootout list and just made it into the *** Three Star group. It was very sensitive and did a good job at minimizing hiss on medium strength signals…it almost matched its big brother CRF-5100 on many stations, although that radio did outperform the TFM-8000 on a few signals. It has a somewhat mellow audio quality compared with the 5100 and many other radios which also makes it quite forgiving of noise but overall it is a capable AM receiver. 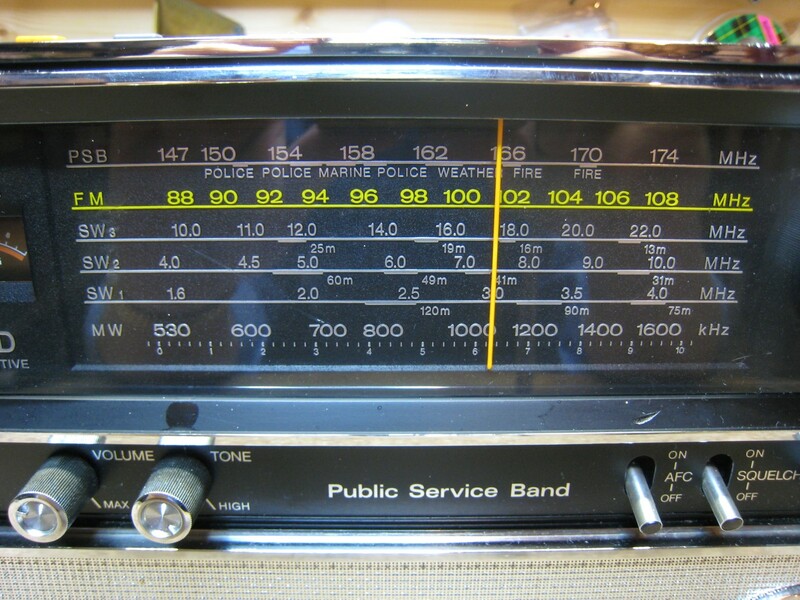 It does not compete on FM with today’s best DSP-equipped radios but one wouldn’t expect it to. Its FM is quite sensitive but not as selective as the best modern DSP radios are. I checked the PSB band and ascertained that it was working normally…I was able to receive my local NOAA Weather stations. 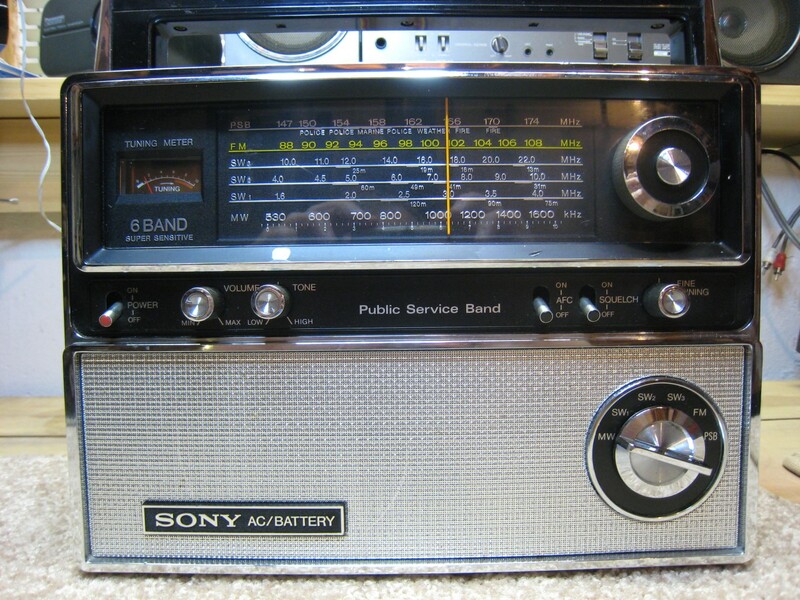 Note that most 70’s radios, such as the Zenith Royal 7000 and Sony’s CRF-5100 are not quite as sensitive in this frequency range as modern weather radios are. 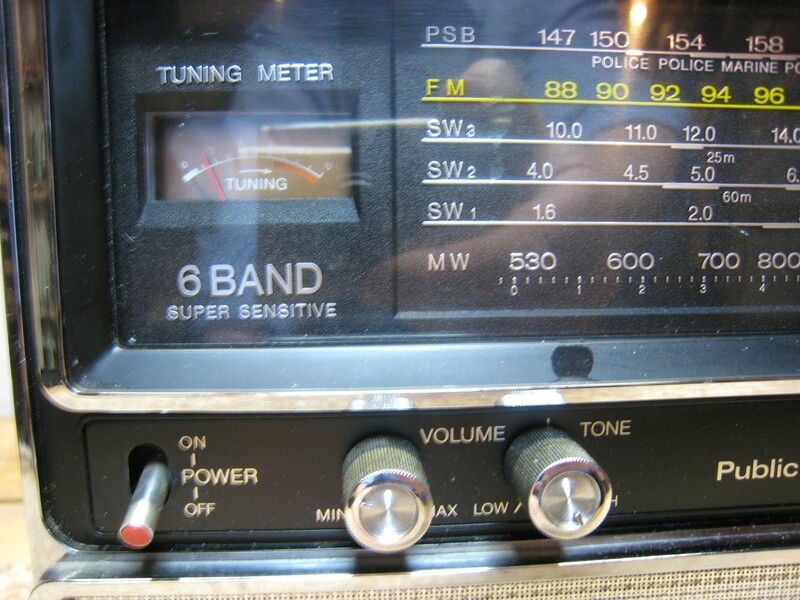 But it was typical of other 70’s era radios I have tested on this band. There is also a non-variable Squelch control for this band. Conclusion: The Sony TFM-8000W is a great example of the many fine radios from Sony’s heyday. 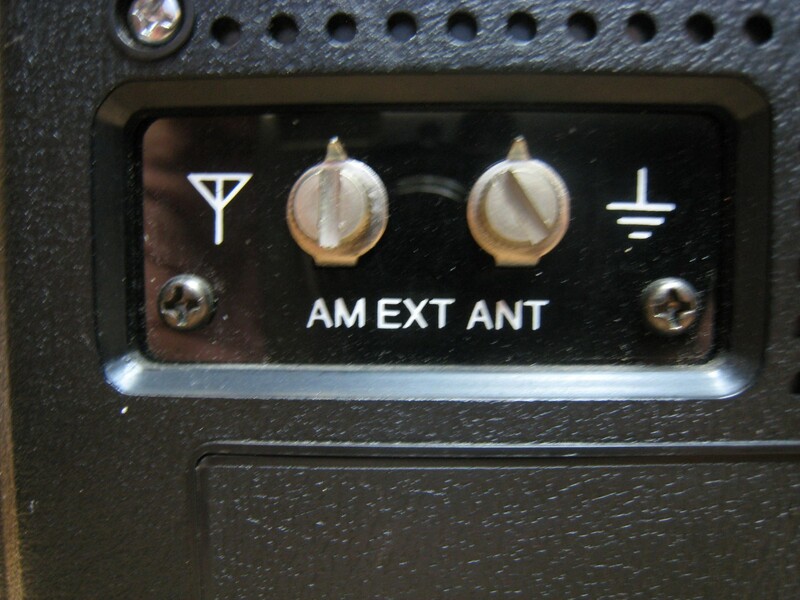 It is a relatively sensitive AM receiver which also includes FM, SW and PSB. An all analog radio it will run for a long time on 4 D cells or you can use its built-in AC Power Supply. 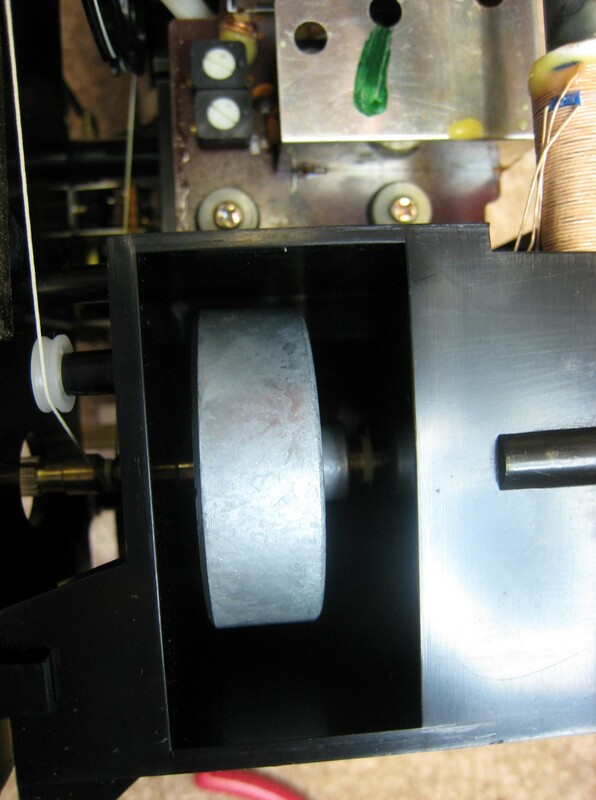 Its flywheel tuning is very rare in a portable and a real joy to use. It has a very attractive and clear dial scale, it’s built with old-style Sony quality and will be a delight for fans of analog radios. Recommended.